Sauté the chopped onion on medium heat with a dash of extra virgin oil. Beat two of the eggs, stir in the onions, rice, melted butter, salt and pepper, parsley, romano and garlic. Place the contents in a large bowl, cover and store in the fridge for 30 minutes. Dice and combine the mozzarella, provolone and ham into cubes. Add breadcrumbs to a bowl and place to one side. Whisk the last two eggs in another bowl and place to the side. 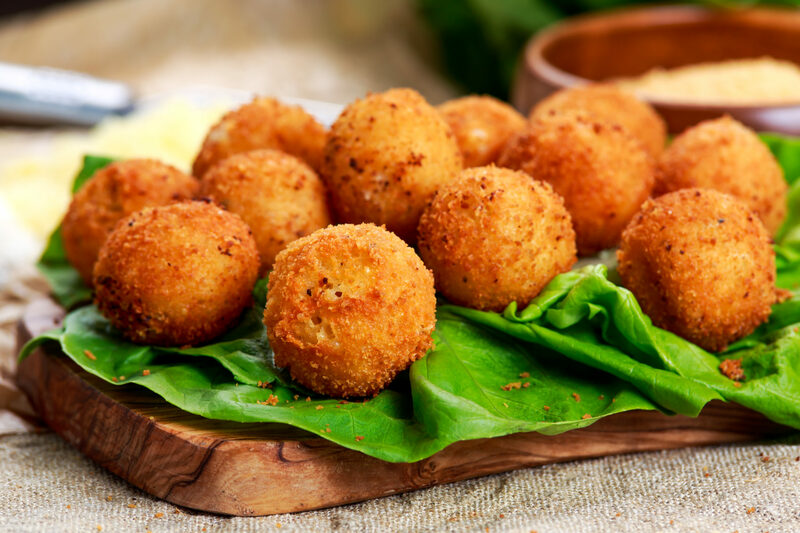 Create balls by forming a ball of the rice mixture around cubes of ham, cheese, and provolone . Dip the balls into the egg mixture, then the bowl of breadcrumbs to batter the balls. Drizzle enough oil into a frying pan for the balls. Fry one-two at a time, turning to ensure they aren’t burned. Ensure they are cooked right through. Serve hot with relish or chutney.